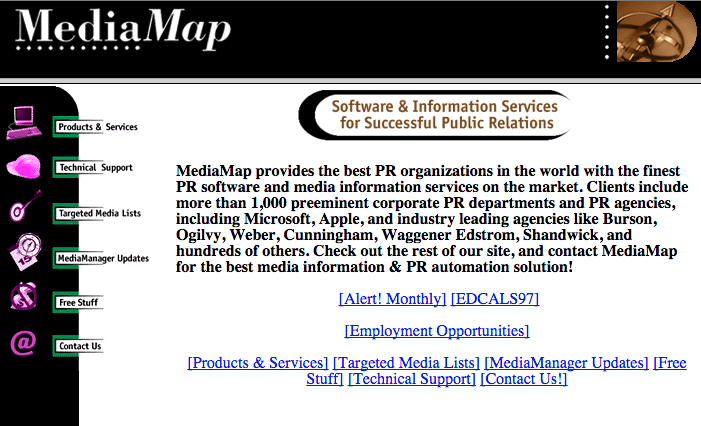 Behold my first first site* from more than 20 years ago. I didn’t design it, but I thought it looked alright at the time. Now, it’s painful to look at. Most of my time was spent building pages and updating what little content we had. I also hacked around with some PERL scripts that collected form information. This was the company’s first site. Management hadn’t prioritized a web site in 1996, I decision I didn’t agree with. I was experimenting and accidentally left a web server with the equivalent of a “hello world” page running on my laptop while I went to a meeting. When I came back a prospective customer had found the page and sent me an email. We had this site up and running shortly after I told the founder about this new prospect. * Officially, this was the first site I was paid to work on. Sometime in ’94 or ’95, I created a short-lived cocktail recipe site that I hosted on my shell account. I doubt anyone other than me ever saw it.